NOTE: This information is good as of 7/22/2015 and is subject to change. I had posted earlier that this was specific to Free users, but it has nothing to do with Free or Pro. Reposted to reflect the accurate behavior. The limit was increased to 200. See the following blog for more details. 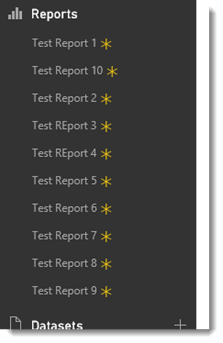 I was looking at the Power BI Community Site and someone had indicated that they cannot save a report. When looking into that Activity ID, it appears that we have a limit of 10 reports. This has nothing to do with if you are a Free or Pro user, but rather a resource limitation based on your Dataset/Model. When you try to save the 11th report against the same Dataset, you get the error above. If you create an 11th report against a different Model it will work.